Running a marathon is thirsty work, especially if you happen to be attempting to complete the 26.2 mile course dressed as the back end of a donkey. Fortunately for those competing at the 2013 London Marathon Lucozade had a nice surprise lined-up for the exhausted masses as they reached the 23 mile mark. 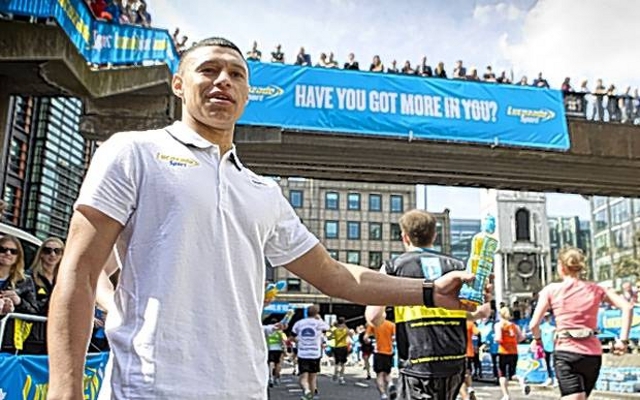 The drinks manufacturer had a little surprise for the thousands of runners looking to get on board some much needed fluids as they had brought in stars from the Rugby and football world to hand out refreshments as they neared the finish line. Welsh rugby union star Leigh Halfpenny, Scottish rugby star Richie Gray and Arsenal and England footballer Alex Oxlade-Chamberlain gave the passing runners a much needed thirst quench and cheered them on to the finish line. One wonders if the sight of The Ox gave Gunners fans present the boost they needed to keep on running, whilst Tottenham fans were no doubt scanning those stars on show in the hope of having a Lucozade drink handed to them by Vinny Samways?